Yesterday when I arrived home from work there was a letter from the Gardaí informing me that I had been detected speeding at 68 kph in a 50 kph zone at Victoria Quay on Saturday 28th November at 9.07am. The notice even had a photograph of my VW Golf's number plate. I had being driving to Heuston Station to drop Kate off to the train which was due to leave at 9.30am - we were running late. I wasn't stopped at a check point, so it must have been a speed camera or a hand held device - I didn't see it. The letter points out that the fixed fine is €80 if paid within 28 days. But the biggest shock for me was two penalty points are coming my way! I have been caught speeding only a few times - always avoiding a ticket. Twice on the motorbike, and only once before in a car - I think on each occasion I managed to talk my way out of a ticket. Not this time as I was caught by a camera. Ironically, I am known within my family as a slow driver - I'm always being slagged about it. The person driving at 80-90 kph on the inside lane of a dual-carriageway - that's me. I always knew that if I was to be caught it would be for exceeding the limit in low speed areas. In this case I exceeded the limit by 36%, so I suppose I can't complain. The lesson from this is to leave on time - we got up at 8.35 and the train was leaving 55 minutes later. Also a lesson is to watch my speed in low limit areas. 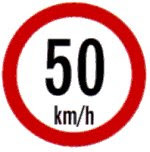 50 mph is very slow, and it is easy to exceed this without noticing. I'll be more careful in future even if it means getting a reputation as an even more boring slow driver!